In this four-minute film, local people explain why they are opposed to oil drilling at Leith Hill, and why they support the protection camp which is providing a focus for resistance, protest and protection. Add your voice to the cause by joining the celebration walk. With drilling – or more drilling – for oil on the cards for four sites in Surrey, it’s worth reminding ourselves of the words of Stephen Sanderson, CEO of UK Oil and Gas (which has an interest at the sites at Leith Hill and Horse Hill) speaking after the discovery of oil at Horse Hill in February 2016. “These deposits extend over 1200 square miles or more of the Weald so if we can… put a commercial development together, then clearly you can see incremental step-outs over quite a large area…. We’re also looking at acquiring more acreage. The quotes below start around 8 minutes into the interview on the YouTube clip below. Please support the campaigns against oil drilling at Leith Hill, Brockham, Horse Hill, and Bletchingley. A local parents’ group, Surrey Hills Slings, invites residents to join them for a walk to celebrate the outstanding beauty of Leith Hill. 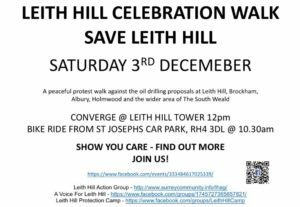 The organisers say: “There is a very imminent threat of exploratory oil drilling upon Leith Hill, the site proposed to be within walking distance & visible from from Coldharbour Lane. There is a real risk of water contamination and huge destruction of the sunken roads leading up to the village. They are leading a family-friendly walk from Starveall Car Park, Leith Hill Rd, Dorking RH5 6LU, meeting up at 10.15, with a view to head off at 10.30am and enjoy the hour or so walk up the hill. oil site at Brockham, licence PL 235. Angus Energy is now floated on the AIM, and telling investors that they will increase production to 400 barrels of oil per day. However they will need planning permission before they can extend the existing well bores or drill a new well, as well as a different permit from the EA. At the time of writing, no planning application has been submitted. Mole Valley residents turned out in force in Dorking on 8 November to hear about the oil drilling threats across the area. They showed strong support for the people from all over England who have set up a camp on nearby Leith Hill to protect it from drilling. 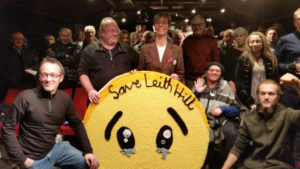 Although the Leith Hill drilling has been allowed to go ahead by the Planning Inspectorate, many pledged to stop it going ahead. A team of researchers from The School of Advanced Study, University of London, The University of York and Liverpool John Moores University is launching a joint research project to look at the policing of protests against fracking in England and Wales. Horse Hill Developments Ltd has submitted its application for further testing and drilling at Horse Hill. The public consultation end date is 12 December 2016 – though the Council will normally take account of comments received up to the date the decision is made.